Sowbugs and pillbugs are about 1/2 inch long, dark gray and oval. Sowbugs are flattened and have two tail-like structures on the rear end of the body that pillbugs do not have. Sowbugs and pillbugs are small animals more closely related to lobsters than to insects. Although sowbugs resemble pillbugs (roly-polies), sowbugs are incapable of rolling up into a ball. 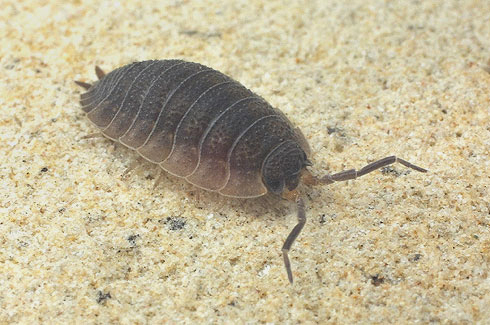 A female sowbug or pillbug carries her eggs in a pouch for several weeks until they hatch. The young remain in the pouch for a time. About 50 young develop in each brood. Sowbugs and pillbugs feed on decaying vegetation and sometimes tender vegetation. They breathe by means of gills and live under vegetable debris and other objects lying on damp ground. They are sometimes found in damp basements and crawl spaces, but they do no structural damage. They die soon after and may be swept up. Large numbers of sowbugs or pillbugs in a basement or crawling in the upper part of a house usually mean an abundant number outside. Although primarily scavengers, during wet weather, sowbugs and pillbugs may come indoors and seek refuge under and in potted plants. Occasionally, sowbugs and pillbugs feed on the roots and tender portions of vegetable and ornamental plant seedlings. Feeding would tend to be at night or in the dark. They may infest house plants where they might damage roots if severe.